After their refreshing debut EP, Warm Blood, The Beths carry the same electrifying sound with the full length debut, Future Me Hates Me. Hailing from New Zealand’s suburbs, The Beths having been performing high energy guitar pop for years, until finally signing to Carpark Records in 2016. Beginning with the electrifyingly passionate “Great No One,” the band sets out for what’s to come, with a blaring guitar sound, spirited vocals, clever songwriting, and infectiously catchy pop hooks. 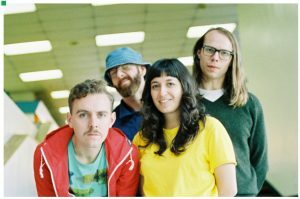 The Beths are a band that wear their influences on their sleeve. With influences like The White Stripes in their early years and Weezer, they don’t shy away from where they come from but still know how to make their sound their own. Her soft yet lively vocals are a match to the likes of Courtney Barnett and Carrie Brownstein and blends with her band’s instrumentation in such a perfect harmony. Whether Strokes is wallowing about a failed relationship on the track “Little Death,” or finally displaying optimism about her life on “River Run Lvl. 1,” the production melds together with her vocal stylings in such an exquisite form that it feels like a modern rock symphony. This symphony doesn’t just magically appear. Guitarist Jonathan Pierce, along with bassist, Benjamin Sinclair, and drummer, Ivan Luketina Johnson, produce their music in a way that allows Strokes and Pierce’s guitars to be the true shining stars in their music and everything else only composes its structure. The guitar radiates on songs like “You Wouldn’t Like Me,” as Stokes sings, “I have been a mess of late/and you wouldn’t be impressed.” Here, Strokes is referring to her feelings of failing her lover. All throughout Future Me Hates Me, she never fails to impress the listener. On this album alone, The Beths proves how far pop music and be taken and refined. Future Me Hates Me’s emphasis on guitar is what makes the record a different experience. Very easily, this could be another typical, well produced, broadly written, facelessly transparent album, but The Beths show otherwise, with an oozing personality and their explosive guitar riffs being the sheer epitome of it. In a completely harmonized fashion, they have not only created one of the best rock albums of the year, but have solidified their potential for the future.